The first UEFA Super Cup to feature a non-Spanish team since 2013 saw a relatively new look Manchester United side take on Mourinho’s old team Real Madrid. On paper, it looked like both teams were playing a relatively standard 4-3-3, however as the match progressed it was clear that both teams were playing completely different than expected systems. Real Madrid looked to set-up in a 4-4-2 diamond formation – with Casemiro largely playing a holding role with Toni Kroos and Luka Modric pulling the strings in the middle of the park with Isco roaming behind Gareth Bale and Karim Benzema. United played what was essentially a 3-6-1 with Matteo Darmian playing alongside Chris Smalling and new signing Victor Lindelof. Jesse Lingard played as a very attacking wing-back with Henrikh Mkhitaryan playing just behind Romelu Lukaku. That then saw a number of interesting tactical developments take shape. Firstly the centre of the pitch was packed with often between 6-8 players trying to occupy the middle of the park. Mourinho was definitely aware of the threat the Madrid midfield posed which showed as the Real midfield were tightly marked whenever they played out from the back, with United choosing not to press high up the pitch. With the centre of the pitch so highly concentrated this left the flanks for both teams relatively open when play switched sides quickly, which allowed opportunities for both teams to get in behind the opposition defence, with Bale looking like the main threat, getting the best of Lindelof on a number of occasions within the opening 10 minutes. In the last example, we see that Bale has dragged Lindelof 25 yards or so into the Real Madrid half, in my opinion, a pointless run from Lindelof as obviously being dragged that far out of a back 3 completely nullifies the point of having 3 centre-backs, as it forces Darmian to shuffle across meaning United could’ve been vulnerable to a direct diagonal ball to Isco if Kroos had decided to play that pass. All the above examples happening within the opening 6 minutes of the match! The poor defending remained a near constant, with Madrid having several fantastic chances – firstly with a Casemiro header from a corner that crashed against the crossbar and again hitting the crossbar from a Bale shot in the second half that De Gea couldn’t react quickly enough to save. United also had a fantastic chance with Pogba losing Modric for a free header that Navas said and palmed into the path of Lukaku, who somehow managed to sky the ball over the bar from 7 yards out. United improved greatly in the second half with the introduction of Rashford, and I can’t help but wonder what the result would’ve been if Rashford played the full game ahead of Lingard. Isco won many plaudits for his performances at the tail end of last season and he impressed again last night in his free role. He was a constant thorn in United’s side, knowing perfectly when to drift out wide to exploit the space created by Lingard pushing forward or when to play in the hole in front of the United defence, allowing Modric and Kroos to drop slightly deeper to dictate play. This moves me nicely on to my next point, the midfield quartet of Casemiro, Kroos, Modric and Isco defies superlatives – they bring so much balance in skill sets alongside fantastic vision, technique and everything else you could ask for from a midfield. 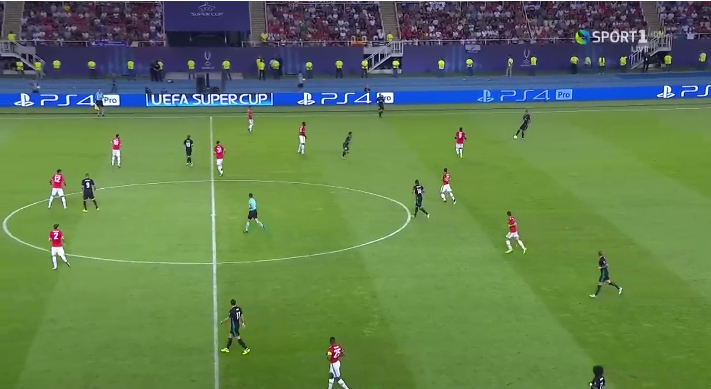 The result is one of the most press-resistant midfields I’ve ever seen (up there with Barcelona under Pep), check out the video below for an example of what I mean – almost 2 minutes of continuous possession (although this does demonstrate some good defending and discipline by United). Isco topped off a fantastic performance with a well-deserved goal that shows what the advantage of good technique and quick thinking can do, with his linkup with Bale leaving the United defenders with nothing to do except stand and watch as Isco calmly slotted past David De Gea.